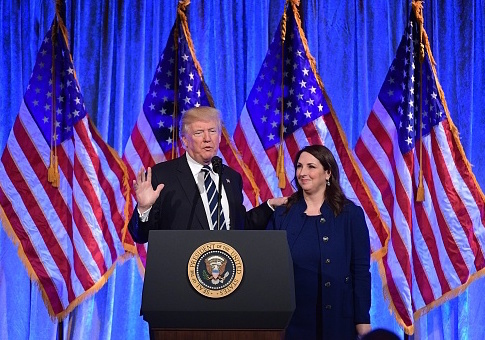 Republican National Committee chairwoman Ronna McDaniel on Thursday wrote a memo to party contributors warning them to stay away from the Koch political network, intensifying a clash between President Donald Trump and the Kochs. In the memo, obtained by Politico, McDaniel chastised the Koch network for announcing, in her words, that "they will no longer support only Republicans running for office, and that moving forward they will support candidates that fit their agenda—even if they are Democrats." McDaniel's move came after Koch network officials said at a weekend retreat that they would not support Republican Rep. Kevin Cramer, who is running against North Dakota Sen. Heidi Heitkamp in a crucial 2018 Senate race, saying he is "inconsistent" on issues important to the Koch network, like reducing government spending and supporting free trade. Cramer has backed Trump's protectionist trade policies and praised his administration's move to provide up to $12 billion to farmers affected by retaliatory actions taken by China. The Koch officials over the weekend also criticized the Trump administration and indicated they may help Democrats. "Some groups who claim to support conservatives forgo their commitment when they decide their business interests are more important than those of the country or party," McDaniel wrote. "This is unacceptable." McDaniel told donors that the GOP has been prepared for this for years, noting that the Koch network has developed its own data program for Republican candidates to use, which rivals the one created by the RNC. "We built the most sophisticated data analytics and digital operation that American politics has ever seen. We defeated the ‘vaunted' Obama data machine and used it to help President Trump win the 2016 election," she wrote. "Unfortunately, while we were building these state-of-the-art capabilities, the Koch network built their own competing data platform." "From the beginning, the RNC had concerns about any outside entity building a data operation to compete with ours because we knew they could potentially weaponize that data against Republicans if their business interests conflicted with electing Republicans," McDaniel added. "Sadly, our concerns were recently proven true." McDaniel reminded donors that the Republican Party is the only entity that can be trusted with the data needed to help Republican candidates win, noting that Trump has "put his faith in the RNC as the entity that he works with to elect Republicans." Koch spokesman James Davis did not respond directly to the RNC letter but suggested to Politico that the network will work across party lines to "help people improve their lives" and "create a society of mutual benefit—where people succeed by helping others." McDaniel's warning came on the same day that Trump castigated mega-donor Charles Koch, chairman and chief executive officer of Koch Industries, which he runs with his brother David Koch, who serves as executive vice president. Charles Koch of Koch Brothers, who claims to be giving away millions of dollars to politicians even though I know very few who have seen this (? ), now makes the ridiculous statement that what President Trump is doing is unfair to "foreign workers." He is correct, AMERICA FIRST! Earlier this week, Trump blasted the Koch brothers again on Twitter, saying they are "against Strong Borders and Powerful Trade [sic]." This entry was posted in Politics and tagged Donald Trump, Koch Brothers, Republican Party, RNC, Ronna McDaniel. Bookmark the permalink.